Conflicting track sets loaded at the same time are a common issue. This post describes how to remove such conflicts without losing laps recorded. Before I start, here are the basics: LapTimer uses sets of triggers to define tracks and track configurations. Two track sets are (potentially) conflicting, if the geographic areas spanned by the triggers in the track sets, intersect. The most common situation happens with multiple configurations of a track (longer, shorter, moves start / stop, etc.). The following example shows a conflict between 'Norschleife BTG' (used during Touristenfahrten, separate start and stop trigger) and 'Nordschleife' (the full track configuration with one start/stop trigger). We start with a number of recordings for 'Nordschleife BTG' and a track set loaded for 'Nordschleife'. You can see this state in step #1. Now the track set 'Nordschleife BTG' is loaded using the Add-ons View (step not shown). Turning to the Lap List, we get the warning that there are track sets overlapping / conflicting (#2). Pressing the alert away, we see that the 38 POIs added for 'Nordschleife BTG' and 'Nordschleife' conflict - shown by a red exclamation mark. This is the starting situation for resolving the conflict - the topic of this post. As for the next track day 'Nordschleife' configuration is used, we decide to remove the 'Nordschleife BTG' track set again. 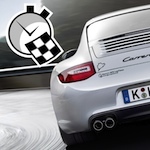 You can accomplish this using the 'swipe' action on the POI row in section 'Nordschleife BTG'. A 'Delete' button ('Löschen' is German) appears. We press this button and receive an information that the POIs are deleted, but not the 2 laps recorded before (#5). Conflict resolved. You can load / unload track sets at any time. As long as you see red exclamation marks, chances are good you will have problems on track. So please resolve the conflicts as soon as you get them. The upcoming version 14 will automatically purge conflicting track sets when a certified track set is loaded.